Larger than life is the phrase that comes quickly to mind when describing Big Al Anderson. For this writer, it's because the first time I saw him play, I thought the smoky club was playing tricks on my eyes. It looked like a toy Telecaster that the guy was playing, like it was a joke. Then they started playing. (Playing? Then the bomb went off, I mean.) My jaw hurt for about two days afterward. It's no wonder, really. The whole atmosphere of NRBQ in those days was very circus like. If clowns or elephants came on stage, it would have seemed perfectly in step. Whether they were doing a cover like "Scarlet Ribbons" or "Our Day Will Come" or burning the place down with "Rocket In My Pocket" or "Get Rhythm" or forty others like it, there was a controlled cacophony, a bandemonium that was always percolating, rising and falling right about the temperature that the top comes off the pot. One of the puzzling things about the legendary rock and roll band NRBQ (and many of us opine that it was the best rock and roll band in history) is how their very iconoclastic and rebellious nature made real fame and fortune the carrot on the stick that kept moving just out of reach. They would gladly play the gig, but they would not play the game. Every night, they played every style of music with verve, a reckless abandon and a musicality that is literally unknown in today's music scene. One can only hope that in the future other touring bands of this caliber may emerge, but I'll believe it when I hear it. Although chronically misunderstood, they were still the critic's darlings and a huge cult favorite, and stayed together for thirty-five years. Their recordings are many, and the best introduction for those new to the band is probably the 2 disc Best Of on Rhino called Peek-A-Boo. Better songs about girls, cars, and food cannot be found anywhere. 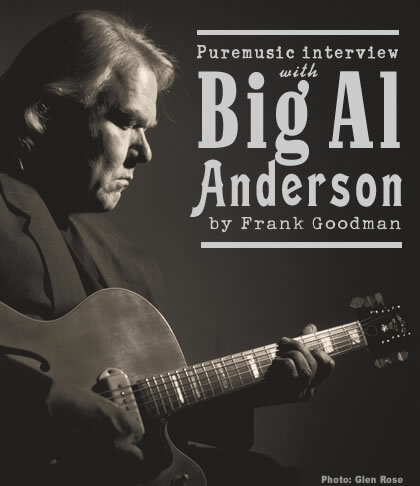 After 23 years in NRBQ, Al came to Nashville to be a songwriter. He'd already had some success, and had a sterling reputation. He'd been getting the George Harrison treatment in the band forever, a couple of songs each record. That really pisses a guy off, as George himself makes obvious in many places, including the 6 CD set The Beatles Anthology. Al arrived writing with the likes of John Hiatt, Carlene Carter, and Craig Wiseman, and began to crank out a huge catalog and a long list of hits. You can see the impressive list of songs covered on the artist's website. You can also pick up the landmark new record by Al, After Hours. It's a jazzier record, where Al gets to croon, and play up his jazzy side--it's fantastic. With a life like Al Anderson's, you can only scratch the surface in a long conversation. But we shot the breeze for a good long time--he was extremely friendly and giving of his time and self. He'd pull down a guitar from the studio wall from time to time, to illustrate a point he was making, or just to play something. Yeah, I think I ought to set that new camcorder up and do more interviews in the studio--that's coming up. But now, a conversation with the one and only.